Before I left Melbourne for a month in Brisbane, I vowed to learn seven poems by heart – this would easy, I thought, because I’d be walking by myself and it would give those walks a focus. What I should have done was to choose the poems and copy them before I left home. Then I would have had them at hand. I ran out of time. Of course. Needless to say my city walks managed to take me past Folio Books in Brisbane. They have a good poetry section, unusual for a small bookshop these days. On my first visit I bought a selected poems of Tomas Tranströmer. I haven’t read this poet – to my shame – so it was a good opportunity. I’ve memorised his ‘Weather Picture’ now, which I chose for its beguiling apparent simplicity. It’s a little corker of a poem and I’m delighted to have discovered this poet. 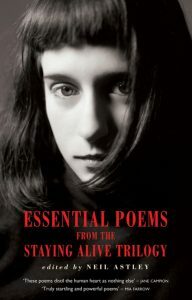 On my next visit to Folio Books, I bought Essential Poems from the Staying Alive Trilogy, edited by Neil Astley. Rather snobbishly I tend to stay away from anthologies that promise to make me cry, rejoice or celebrate. No longer! This anthology is the perfect travelling companion. I have to say that I’m tempted now to get the hefty 500 poem per volume trilogy! (Ssh, don’t tell The Accountant!). Having made such a late start, it’s unlikely that I’ll memorise all of these before I get home. But I reckon this will get me back in the habit of memorising poems, and that’s what I want. It’s a good habit – it means you always have an anthology in your own head. It also means you pay attention to writing at the word level. Taking it slowly. A good time to relearn this.